It seems so long ago, stepping onto a yoga mat for the first time. I had arrived reluctantly after finding that I had borderline high blood pressure, had anxiety and did not exercise at all. I was 38, I needed to do something, and my wife Sue, who had been practicing yoga for a while, suggested it. I was the only man in the class, I found it hard, my ego got bruised and I did not really enjoy it. Sue – being a determined person – kept me going, and after a few weeks I did start to notice a difference. I could not explain what that difference was, but something was changing. My blood pressure dropped back a bit and I found I could touch my toes again – with the secret being to actually not try! I was hooked and inhabiting a body that had not been damaged by sport, it seemed to really respond to the yoga postures in a positive way. In 1999 I decided to train to be a yoga teacher, I wanted to encourage more men to take part and I could see a way of this bringing in some additional income which could help us move to Cornwall. Over the next 15 years I taught hundreds of students in private classes and on yoga weekends, with people coming from around the world to attend my events. During this time yoga changed a great deal. The practice itself stayed the same but the way it was marketed changed completely. Those magazines from the late 90s look like they were from another age, as images of young thin models doing advanced yoga postures seem to take over everything. Each interview seemed to feature a celebrity yoga teacher, or told of someone who practiced for hours a day and also did cross training or did several other sports. I had decided to call my yoga business ‘Yoga At Work’ because I wanted to help yoga work for the individual, especially the person who struggled to roll their mat out every day or even once a week. I mentioned earlier that my body had suffered no injuries from any sport, this was because given a choice of being active or doing nothing, I chose nothing every time. I preferred sitting down! As some of you know, I run a very successful Internet business, but this also took up a lot of time, and I enjoy it. So I know the issues in finding time to develop a yoga practice. So in 2000 when I entered my 50s I was in very good shape, coming from a family who all had arthritis, I had none. My body could spring into various yoga postures without giving it much thought. The problem was yoga was becoming a job, something on my to do list to cross off and I was teaching 25 weekends a year and my family was growing up fast. The hours going into my Internet business was about 50/60 a week. The yoga weekends, although enjoyable, took a lot of planning and after each one I was feeling more exhausted. Then, for some reason (that escapes me) I also decided to join the gym. This was the first sign that something had to change. During the health checks my blood pressure had risen again. I also at this time noticed that anxiety was creeping back into various situations. It was time to take a step back. Workaholics when asked to cut back usually list things to cut out that actually don’t help, which is what I did. It was only after sending out my Yoga Weekend schedule for 2013 that I realised that my yoga teaching had to be on that list. I was burnt out, I hid it very well and so it was really hard to stick to my decision when so many of my students called or emailed to ask to me to carry on. And in some cases I did, but in the end my body and mind made me stop. So I carefully chose a wonderful team of teachers to carry on with my Yoga weekends in Cornwall. I still introduce all the weekends we run with Sue, and it is lovely seeing familiar faces enjoying the teaching of other teachers. So is this the end of my journey with Yoga? No, far from it. I find myself returning to the source of what inspired me all those years ago. I was always a reluctant yogi, and that has not changed, but my practice is deeper and more meditative now. I used to be able to fit Yoga Nidra into 5 minutes! Now I love a 45minutes Mindfulness body scan. The other thing is my body is changing, now in my mid 50s some postures take longer to get into and I can hear my ego say ‘try harder’! My practice is now teaching me stillness and most of all patience and having the ability to let go. Mindfulness meditation is now a huge part of what I do, spending time in nature and being still is also part of my yoga practice. I don’t set targets of 20 sun salutations before breakfast, I listen to my body and self prescribe the postures that will help me most in the day ahead. Yoga is the best preventative medicine there and wonderful for rehabilitating the parts of you that sometimes needs some extra TLC. 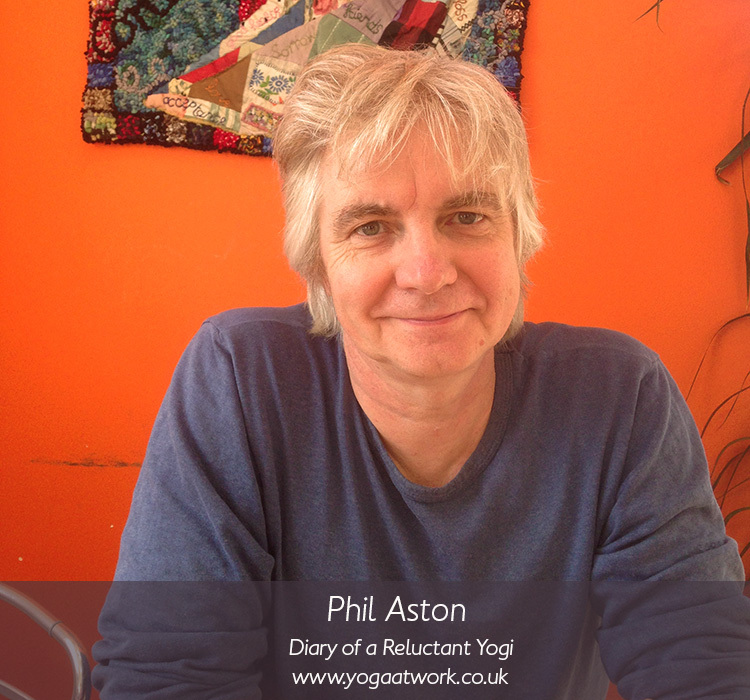 Thank you for being part of my journey and reading this the first installment of a Diary of a Reluctant Yogi.